I thought there were mountains out there to the west? Aaaah, what a summer...except, perhaps for the smoke. The time when we hope the bees are providing for us is very soon over, followed by the time we hope they’re preparing themselves for winter. You should be taking off any honey supers in the next week or two. I find it useful to leave the sage and rabbitbrush flow for the bees, although you could feed sugar syrup to replace it if you want to harvest that flow. After you’ve removed any supers, check the condition of the hive. There are four things you’re going to be wanting to keep an eye on. 2. Check the mite levels with your preferred method...I suggest the sugar roll or alcohol wash. You want the level to be less than 3%, preferably down around 1% when they go into the winter. Remember the bee population will drop faster than the mite population as they start getting rid of the drones, and reducing the population to only winter bees. Now that your honey supers are off, you’re more open to different treatments. Your treatment plans (assuming you’re going to treat) need to take into account several variables. MAQS works well, since it controls mites within the capped brood which is still present. We do, though, still have days above 85 degrees, which are contraindicated for MAQS. Oxalic acid works well on the phoretic mites, but as there is still capped brood, you’re only affecting, perhaps a third of the mites. If the temps don’t cooperate (too warm), I’ll sometimes use something not quite as efficient, such as Apilife Var (mixture of essential oils on a cellulose type pad) which can be used in a warmer temperature, then retreat later if needed after a second mite check. READ AND FOLLOW THE DIRECTIONS! Also check the HBHC Tools for Varroa Management. 3. How’s the queen doing? If the pattern is getting spottier, or the population just isn’t up to snuff, or perhaps mite numbers, EFB or chalkbrood is present, you might consider requeening. Remember, the queen that’s there at the end of Fall is the same queen (normally) that’s there for the Spring buildup. 4. 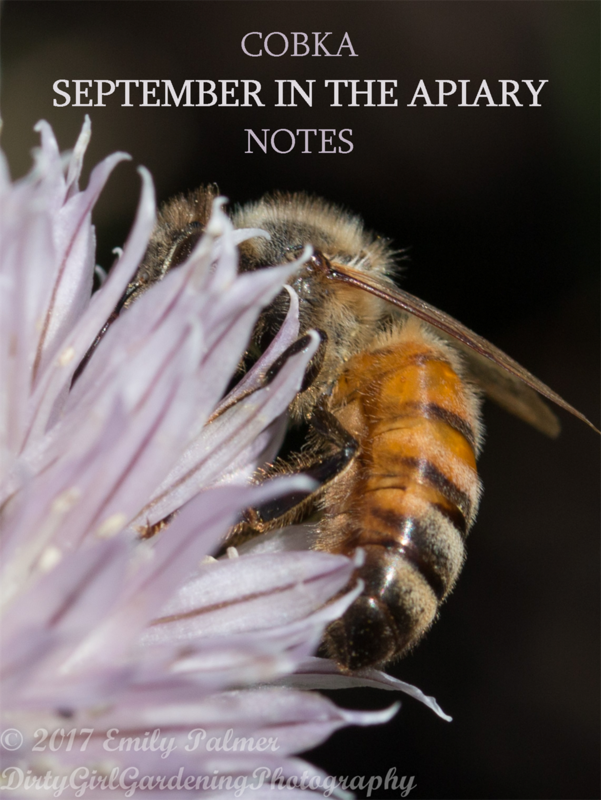 AND speaking of winter bees, one reason that September, especially later September, is important to colony health, is this is the time they are raising the winter bees which will need to last through the winter, keeping the bees warm and helping repopulate the hive in the spring. Having a healthy hive in the Fall helps a lot with overwintering. 5. Ok I know is said 4 items. The fifth one is to remember the saying about molasses in January. Think about when you’re doing your extraction. If you wait until December, you might be spinning till April. Earlier and warmer makes for shorter extractor spins.